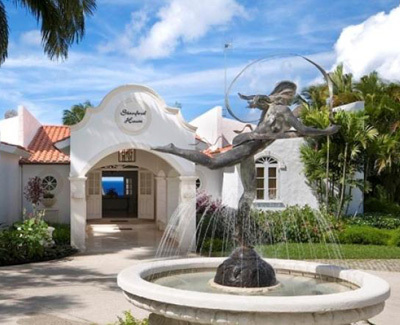 Stanford House is located at Polo Ridge in St. James, opposite the Barbados Polo Club and a 30 minute drive from the Grantley Adams International airport. Commanding an elevated position the property offers magnificent views over the West Coast and to the Caribbean Sea beyond. Stanford House is constructed on one level and offers spacious accommodation of exceptional comfort for up to ten people. The property is particularly well suited to outdoor living and entertaining with a large terrace incorporating a fully equipped bar and lounge seating area. Straight off the terrace, the pool deck offers a large infinity edged swimming pool designed to allow relaxed enjoyment of the views. Fully air conditioned throughout, the generous accommodation comprises: a central reception area which is accessed through an open walkway, front porch and entrance foyer. A large open plan lounge, powder room, five en suite double bedrooms, fully equipped kitchen and a media room with 60" plasma TV with surround sound, satellite TV, DVD player, Sony Play Station and wireless internet access. A spectacular eight foot aquarium separates the lounge and media room. Access to the pool terrace is directly from the lounge and offers delightful views and sunsets. The extremely spacious master bedroom suite incorporates a seating area, 42" plasma TV,dressing room and air conditioned en suite bathroom. The fixtures are modern and include a Jacuzzi tub and large walk-in shower. There are three other guest bedrooms in the main house, all with en suite bathrooms and generous closets. In the garden is a self contained guest cottage with private terrace and views of the west coast. Off the kitchen is covered parking for two cars along with a generous parking area. The staff includes a full time butler, cook, gardener, maid, laundress and a security guard during the months of December - April. Outdoors there is a large Jacuzzi set within it's own pool, a dining gazebo, self contained covered BBQ area with full wet bar and a further seating area beneath a domed gazebo imported from Italy covered with sparkling fairy lights, all complemented by stunning water features, statues and sun loungers. Extending to over one acre, wonderfully tranquil and lushly planted gardens surround the property and mature palms further accentuate the unmistakably tropical environment. The pool and surrounding terraces form the focal point of the gardens with water features, Romanesque gazebo, outdoor dining gazebo, large covered wet bar and Jacuzzi.